Cake? Yes, please! 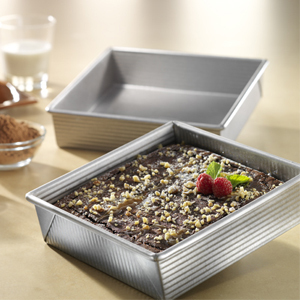 We just got in a hefty shipment of these USA Pan Square Cake Pans, and they’re terrific! For one thing, they’re made of sturdy aluminized steel with a corrugated surface that makes cakes and brownies easier to get out of the pan. For another, they’re coated with an environmentally safe silicon that’s guaranteed not to contain any PTFEs or PFOAs. Better yet, they’re 100% made in the USA! And best of all, as our Item of the Week, they’re 25% off all week long! !